With over 35 years experience, our personnel will provide their expertise to ensure quality work done on time. 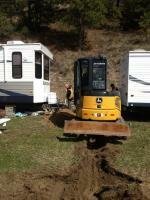 Excavating and Trucking. 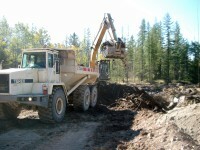 Site development, Earthwork, Utility work, Road work and Development, Equipment rental, New build sewers and basements. No job is too small. For a new basement, waterline/sewer lines or driveway. We also will provide snow removal and debris removal as needed. 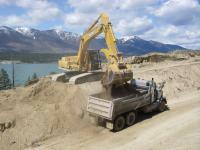 Road construction and land development, residential site development, new home foundations. Safety and accident prevention as well as being environmentally responsible are high priorities of management. We are safe certified with BC forestry safety council and members of PICS. We are also in good standing with WCB. No matter what the job, we are fully equipped with our fleet of heavy equipment from mini excavators to mid size and large excavators, dump trucks, dozers and loaders. We specialize in installation of underground utilities such as water, sanitary and storm sewer.